There are countless CBD companies. What really makes one stand out from the rest? As one of the most popular CBD companies that exists, Endoca has been around since CBD’s humble beginnings. Before CBD went mainstream, Endoca was already a part of the mix. What is Endoca doing differently to stay on top of their game when the market is saturated with competition? Let’s just say we were extremely intrigued…and decided to dig a little bit deeper. When Henry Vicenty (the founder of Endoca) discovered almost a decade ago that the work he was doing to expand the lifespan of people in the Zulu region of Africa suffering from AIDS was actually worsening the conditions of several patients, he knew he must make a difference. Harry Vicenty, founder of Endoca. Photo courtesy of Endoca. Considering the mainstream medicine he was giving his patients for other health problems and illnesses were actually offering side effects that helped the development of the AIDS virus, Vicenty began to question everything he learned in university and began the search for natural alternatives that could restore our health and immune systems without unwanted side effects. Vicenty began researching the health effects of cannabis and went on to grow various hemp plants that contained little to no THC (so he could legally grow them in his home country of Denmark). During this life-changing journey, Vicenty opened a clinic that was free of charge. The “heart” of the clinic was lifestyle medicine, with an aim to teach people how to use natural medicine alongside the prescription medicine they were already taking. What he found was more and more people were interested in learning about the health benefits of hemp. Vicenty began to give away CBD extracts he’d made, as well as hemp seeds so others could make their own extracts. In order to continue with the research he was conducting, Vicenty began to sell his hemp oil. This led to more money to buy hemp and the construction of a high-tech lab with extraction equipment. It was here that Endoca was born. What started as a commitment to offering alternatives to mainstream medicine led to the creation of one of the most reputable CBD companies in the world. With the rising popularity of CBD, hundreds (if not thousands) of CBD companies have saturated the market in the past couple of years. What’s different about Endoca? They’ve been around since the beginning. 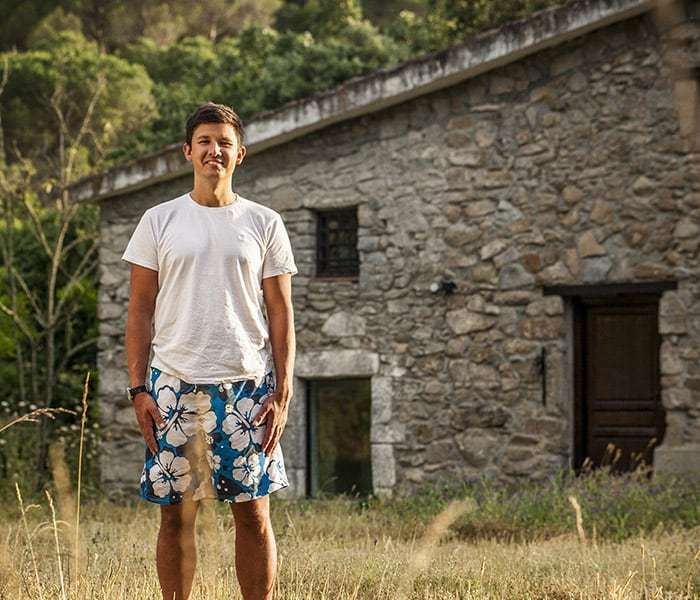 Soon after Vicenty started selling his hemp extracts, he branded the name Endoca (taken from the endocannabinoid system) and created a website, which just so happened to be the first in the world to sell CBD online. Today, Endoca is one of the most popular and widely-recognized CBD brands worldwide. What started as a passion-fueled humble beginning has turned into an empire. Today, Endoca employs over 100 people and sustainably-grows over 2000 acres of organic hemp to create the products that have made them one of the top CBD companies that exists. As Endoca continues to grow, they’re employing local farmers and transforming millions of non-organic acres into rich, organic farmland to cultivate CBD-rich strains of hemp. Endoca’s hemp fields are located in the countryside outside of Barcelona, Spain with each plant soaking up the sun just as nature intended. Their goal? To make CBD a common household staple by the year 2030. Endoca is a bit different than other CBD companies. Sure, they offer the standard tinctures and capsules that are wildly popular around the world, but there’s more. They’re one of the only CBD companies to offer raw cannabinoids (non-decarboxylated). They’re also one of the few CBD manufacturers that offer a CBD suppository. One of the things we really respect about Endoca is their commitment to sustainable cultivation practices and using 100% organically-grown hemp in each and every product they create. Something else we’re wild about? The fact that all Endoca products are lab tested for quality assurance. 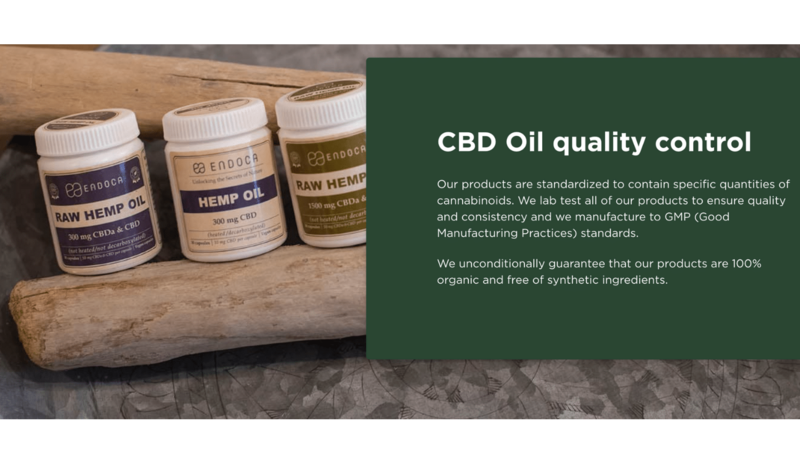 Endoca takes the testing of their CBD products very seriously spending the money it takes and the resources required to ensure quality control of each product they create. Endoca is committed to constantly improving their products and making sure that they’re all consistently above par. Part of their mission is to “raise the bar” for the quality of hemp products available by setting an example. What this means for you, the consumer, is that the products you purchase from Endoca have all been tested to ensure quality and consumer safety. Endoca tests each batch they produce for over 200 various pesticides, herbicides, metals, fungi, mold, and harmful mycotoxins. Testing is performed using cutting-edge lab technology, using scientific techniques and technologies such as HPLC (high performance liquid chromatography) and NMR (nuclear magnetic resonance) to test the composition of their products in order to safeguard that customers receive the highest-quality products that are currently available on the market. Lab reports are done with each batch and can be easily accessed on Endoca’s website, where you’ll find a report from each and every batch they’ve ever produced. Each quality report offers a complete cannabinoid profile, terpenoid profile and distribution, microbial profile, heavy metal profile, and a nutritional profile. At the end of the report they offer a pesticide analysis, with a list of each pesticide that the batch was tested for. 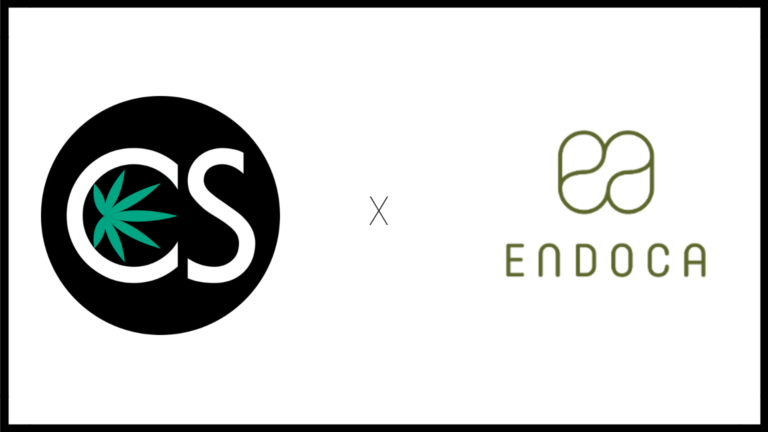 All Endoca’s products are made with full-spectrum CBD extract, except for their CBD isolate crystals (which we’ll explain more about in a bit). According to Endoca, having CBD oil for sale is what they’re best known for. 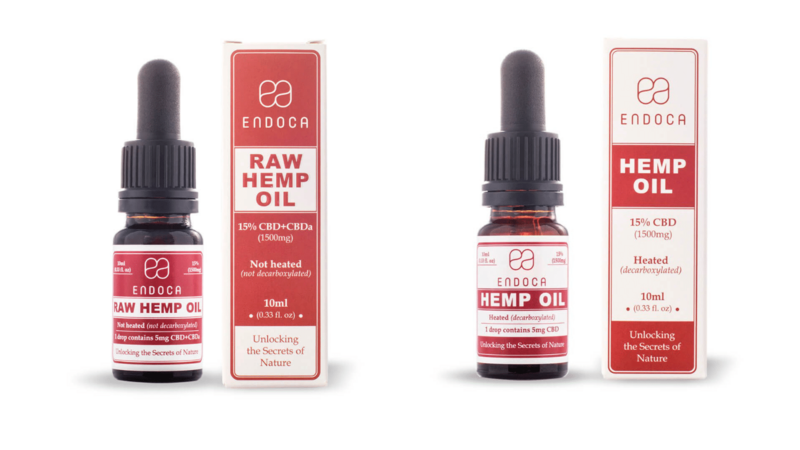 If you’re interested in taking straight CBD oil, Endoca offers two different options: Raw Hemp Oil Drops and Hemp Oil Drops. Both are available in 1500mg ($129) and 300mg ($31) sizes. If you’re wondering what the difference is between raw hemp oil and regular hemp oil, you’re not alone. 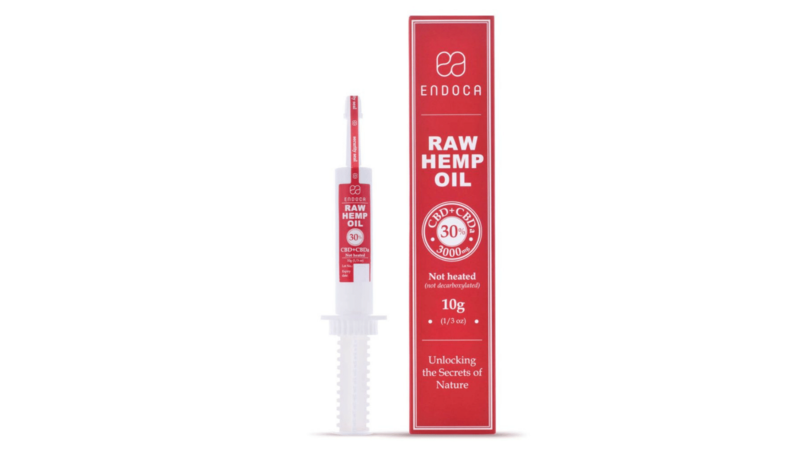 Not many CBD companies offer raw hemp oil, which is something that makes Endoca rather unique. All of Endoca’s CBD oil is made with the whole hemp plant and is extracted using CO2 without any other chemicals. Because their oil is made with the whole plant, it contains both CBD and CBDa (cannabidiolic acid), which turns into CBD when heated. By itself in its raw state, hemp does not contain CBD. It’s CBDa rather, that turns into CBD when it is heated (think cooked, smoked, or vaped) through a process known as decarboxylation. What is the benefit of raw hemp oil? It contains the full spectrum of all the cannabinoids, terpenes, and flavonoids found in the original plant. CBDa is also believed to have a positive effect on non-endocannabinoid receptors and various enzymes found throughout the body. Something to keep in mind if Endoca CBD oil is something you’d like to try: this is hemp oil in its natural state. Endoca prefers to leave their extracts as close as nature intended which means that they don’t add any flavors, colors, preservatives, or fragrance. What this means is you’re getting a strong “earthy” flavored oil that doesn’t agree with everyone. If this is the case for you and an oil is something you insist on, the taste can be modified by mixing it with a few drops of honey to sweeten it up a bit. Endoca also offers a wide variety of other products that allow you to bypass the strong taste of their oils altogether. 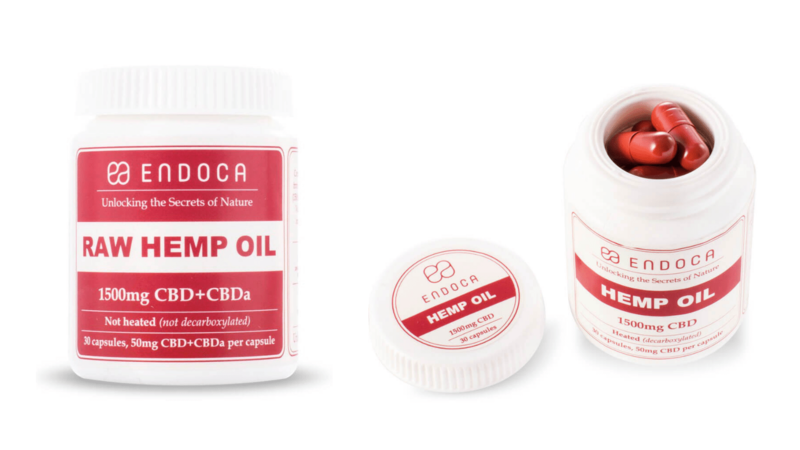 Endoca created their line of CBD capsules and pills for those who are accustom to (and might prefer) taking a familiar pill rather than CBD in its oil form. Capsules are also a great alternative for those looking for the benefits of full-spectrum CBD without the earthy hemp taste. Just like with their CBD oil, Endoca offers both Raw Hemp Oil Capsules and Hemp Oil Capsules. Both are available in 1500mg ($129) and 300mg ($31) sizes. We tried both options in the 300mg size, with each capsule containing 10mg of CBD/CBDa. They look just like regular gel caps and swallow smooth. While they don’t contain the earthy taste Endoca’s CBD oil is known for, we did notice a distinct hemp taste when we let them hang out in our mouth for a few seconds. If you swallow them immediately, however, you’re not likely to notice any taste at all. How did we find they worked? Honestly, excellent. At CBD School we’ve tried countless CBD products and have found not all are what they’re cracked up to be. There’s a reason Endoca is one of the most popular CBD companies that exists. They truly offer one of the highest quality CBD products you can find. CBD works differently for everyone. That being said, Endoca CBD capsules worked for us. We’re prone to headaches…and these capsules helped tremendously. Will they work the same for you? We can’t promise anything, but if Endoca’s transparency and commitment to quality is any indication of how well their products do work, it’s safe to say you’re likely to find the results you’re looking for. Endoca’s CBD Extract is CBD in its most natural form. CBD extract is often referred to as “CBD paste” because of its thicker consistency. They carry 2000mg ($199) and 3000mg ($286) raw hemp extract and 2000mg ($199) hemp extract. Endoca’s CBD Extract goes through less of a filtration process than their regular CBD oil, resulting in a thick, waxy paste that is packed full of benefits. Extraction is performed using a “state-of-the-art supercritical CO2 extraction method” that removes the active ingredients from the whole hemp plant that is then followed by cold filtration. Their 3000mg Raw CBD Extract is Endoca’s maximum strength product and is known as “Golden Hemp Oil” due to its lighter color. Rather than using cold extraction, heat extraction is employed for this potent extract, offering the smoothest CBD extract available. Endoca understands this, which is why they created a line of CBD skin care products full of CBD. Their “So Pure You Can Eat It” Hemp Salve ($64) contains 750mg of CBD and is recommended for instant relief from irritation, excessive dryness, and broken skin. 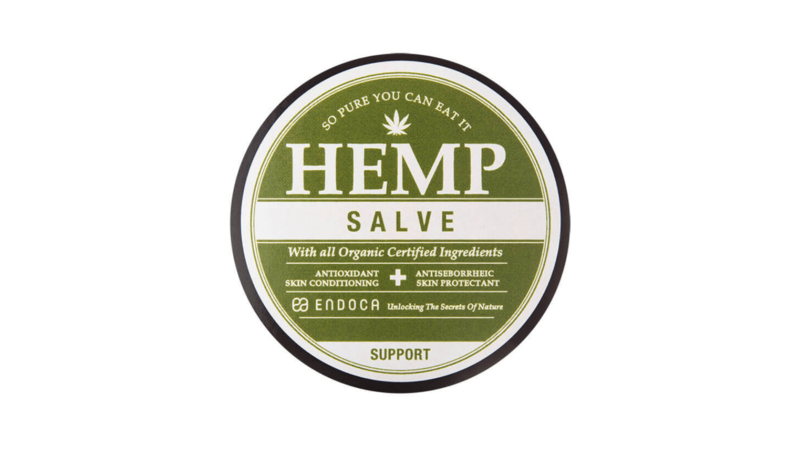 Endoca also advises the use of their hemp salve for dermatitis and as an anti-aging option to keep skin looking young and healthy. 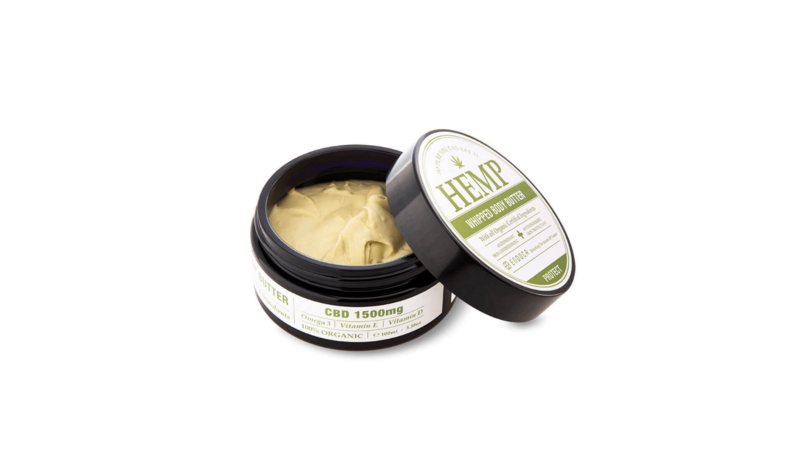 Endoca’s Hemp Whipped Body Butter ($82) contains 1500mg CBD, as well as coconut oil, shea butter, cocoa butter, and hemp seed oil to leave skin soft and silky smooth. It’s designed to offer the moisture your skin needs while protecting from environmental damage. 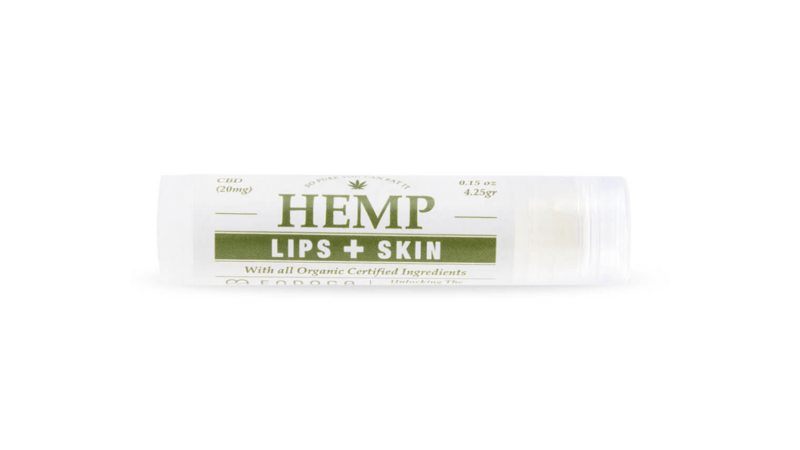 CBD Lips + Skin ($8) contains 20mg of CBD and is designed to provide extra moisture to lips and skin. It’s formulated with other natural ingredients like organic beeswax, organic coconut oil, vitamin E, and more to combat dry lips and skin. Here is a product that makes Endoca truly unique. While CBD suppositories obviously aren’t for everyone, not everyone has the ability to swallow a pill or oil. What’s more, is suppositories are absorbed straight into the bloodstream and don’t have to pass through the digestive tract. What does this mean for you? You don’t have to wait to feel the effects. Endoca claims that the effects of their CBD suppositories can be felt within 10-15 minutes after insertion and will last up to 4-8 hours. Endoca’s CBD Suppositories ($52) contain 50mg of CBD each and come in packages of 10. They are designed to be used either anally or vaginally and instructions are offered both on the packaging and on their website. 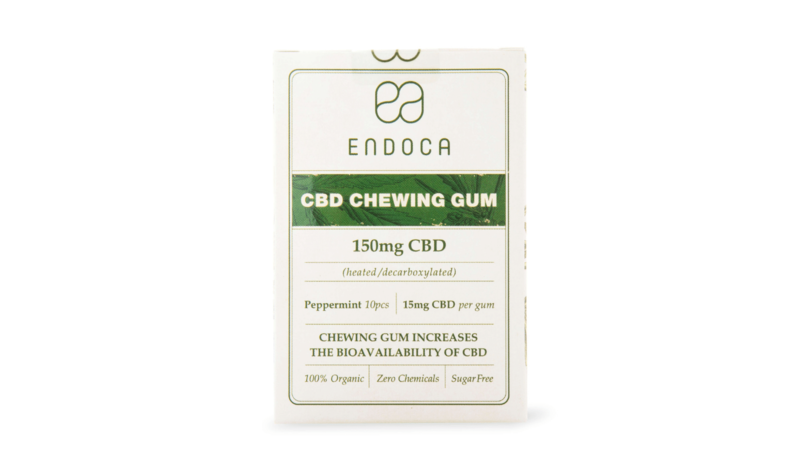 While we didn’t try Endoca’s CBD Chewing Gum ($15), we are definitely fans of CBD gum in general. Endoca’s CBD gum is a bit different, however. It’s ethically sourced from Mexican rainforests and made from natural chicle gum from the sapodilla tree. Because of this it doesn’t have the consistency of the regular chewing gum you’re likely use to. Flavored with a natural essential oil, Endoca notes the minty taste doesn’t last long. If you’re looking for a minty, “bouncy” gum, this one likely isn’t for you. If you’re down to try something different, however, Endoca’s CBD chewing gum does offer a discreet and easy way to enjoy a 15mg serving of CBD. 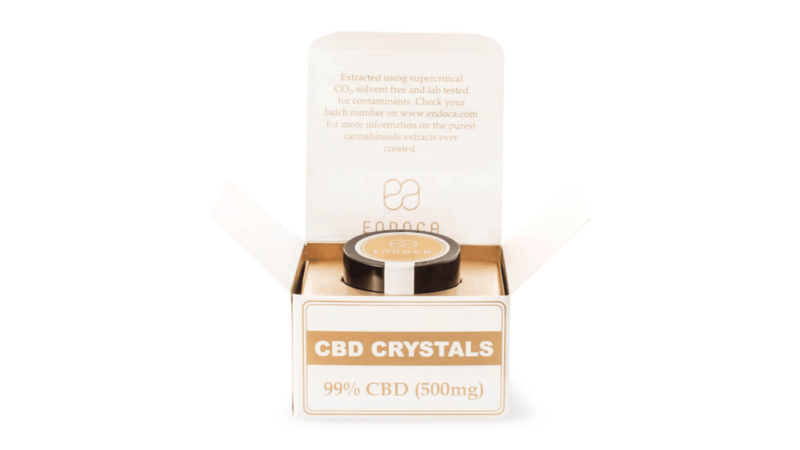 One product Endoca carries for customers looking for “pure CBD” is their Cannabis Crystals ($48). Each bottle contains 99% pure CBD and is designed for those who want to add pure CBD to other products such as edibles, skin products, and vaping. These pure crystals can also be dissolved directly under the tongue. Commonly referred to as “CBD isolate”, these crystals are free of THC and can be safely used by anyone. If you are interested in making your own CBD products or just love using CBD isolate, Endoca’s Cannabis Crystals are a unique product you might want to check out. Although we only tried Endoca’s CBD Capsules, we’re thoroughly impressed by their company as a whole. What makes Endoca so great? For one, all products are made with organically-grown hemp using sustainable cultivation practices. Everything is GMP (Good Manufacturing Practice) certified, a system designed to ensure products are consistently produced and controlled to quality standards. For another, Endoca is adamant about testing their products, which is something we take very seriously at CBD School. They offer third-party lab test results that are easily accessible on their website for each and every batch of CBD they produce, something we can assure you isn’t the case with a lot of companies out there. Dedicated to customer service, Endoca is there to answer any and all questions you might have about their products. If you don’t understand CBD dosages from the information provided on their website, simply chat online with an Endoca representative about what might be best for you. Endoca’s website is full of all the information you need to make an informed buying decision when it comes to CBD. And while we only tried their CBD capsules, we’re sure that their other products stand up to the quality we experienced for ourselves. Endoca is, after all, a CBD company that’s been around since the beginning. And as one of the most popular CBD manufacturers that exists, they’re obviously doing something right. They’ve also set up the Endoca Foundation, a non-profit umbrella for their social projects that include a hardship fund for parents who can’t afford CBD oil for their children and the Institute of Cannabis, Natural Medicine, and Sustainability.